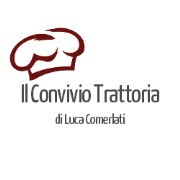 Trattoria Il Convivio offers fine cuisine with dishes tied to the tradition. Quality, freshness and selection of ingredients of the territory "kilometer zero" are the core value in the preparation of the dishes. The restaurant offers 50 seats with menu and up to 80 seats for banquets. The ambience and decor is sophisticated and refined to offer customers a moment of conviviality.